My 2nd installment of Friday’s Fave Five. I love looking back on the week to see what has happened but picking out my favorites is hard! 1 – My new baby! I am in so love!!! 2 – I don’t know where these purple beauties came from. We planted them last year in our deck boxes and they popped again. But they aren’t supposed to! I guess they liked us. 3 – I know this really shouldn’t be a fave, but it is. Now that I have posted a picture of my stupid mistake (getting burnt) for properity, it will be a constant reminder to me to NEVER LET IT HAPPEN AGAIN! 4 – My little guy is sick again (another double ear infection). The only good thing about him being sick is that he likes to cuddle and be held, a rarity these days. 5 – Look at that face! He loves the water so much (although I think that’s where his ear infection came from). I get a huge smile on my face when I see that look on his face. 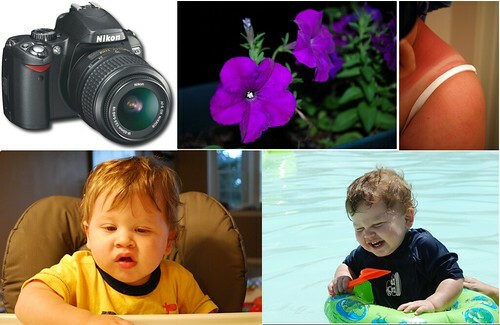 Great photos of your little one! Enjoy the cuddles; I hope he's feeling better soon. Wonderful captures. I love your little one's laughter in the water. A great weekend to you. That last picture is just so cute! Poor guy — hope he feels better soon. I tend to burn easily, too. Used to get fried quite often — I don't remember hearing about the dangers of skin cancer at all growing up. It's one of those things I fear, but I figure I can't do much about it now except try to avoid getting burnt in the future and hope for the best. Besides all that sunburns can be just miserable. Hope you're feeling better! Those flowers are pretty! Glad they made an encore. Ouch! That sunburn looks very tender. Great photos of your boy — was that taken with the new Nikon? I could always tell when the kids were getting sick.. They'd turn super sweet and snuggly! How's the burn healing? What a cutie pie! I remember when our oldest was sick then, and only then, would she cuddle. Now she's 28 and she STILL isn't a touchy-feely type of girl. Luckily, our son turned out to be just the opposite. Hope your little guy feels better soon. Try some aloe vera gel on that burn. Works every time for me. Wonderful pics! Your son is adorable! I hope he is feeling better! I don't even know your son, but I smile when I see that sweet little face in your pictures. 🙂 What a blessing! Enjoy him. I like the way you expressed it all with pictures. That sunburn looks like it hurts! I hate it when that happens.. . happy friday! I know that look in number 4 well. My daughter used to get ear infections constantly until she got tubes. Hope your little guy is better soon! OUCH to that sunburn. Have you tried the aloe vera gel out there that has novacaine in it? I think it's Hawaiian Tropics that puts it out. It helps the pain. Hope that is better soon too.